Maps and location Hotel Cruz de Popayan Sucre Bolivia. Sucre Hotels and Sucre Hostels Bolivia. Lasts Reviews from Hotel Cruz de Popayan Sucre. 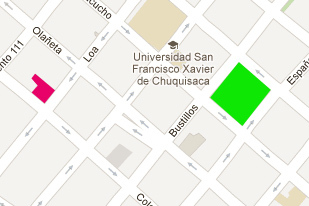 - Bus Station: Take micro "A" and ask to bus driver stops at plaza 25 de Mayo, the ride costs Bs. 1.50. Or take a taxi (only Bs. 5,00/person). - Airport: Take a taxi from main door, the ride costs Bs. 25,00 or ask for a pick up service for $us. 5,00 (One way).